Exchange your vows on an Island overlooking a magnificent water hole where a chorus of birds and frogs sing in the twilight and a family of inquisitive Nyala look on and bare witness. 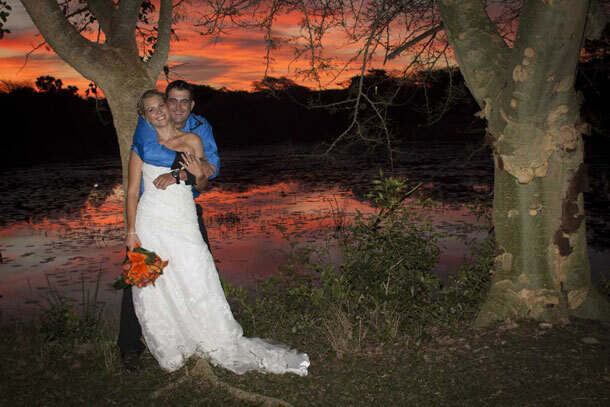 Imagine an ‘Out of Africa’ theme dinner in our boma-style restaurant or a candlelit bush-braai wedding reception. An ancient sand forest and world heritage site will set the wonderful background for your fairytale wedding. Spend your first night of marriage in a romantic honeymoon tree house while family and friends enjoy our fully catered and air-conditioned Lalapanzi Lodge and Spa. Get a maiden and bridal pamper package for you and your bridesmaids before the wedding in the spa. Bonamanzi offers guided bush trails, game drives and a relaxing boat cruise on the Hluhluwe River, following the call of an African fish eagle. Enjoy the big 5 Hluhluwe Imfolozi Park or the laid back beaches of St. Lucia, or experience the feeding of our impressive crocodiles. Bonamanzi caters for exclusive weddings of up to 20 guests in our exquisite Dinizulu lodge, with separate cottages, private lounge and pool area. The boma-style restaurant can take up to 80 guests, the forest chapel is situated near the palm island that makes an excellent venue for your ceremony and the African-style thatched venue can cater for up to 300 guests. 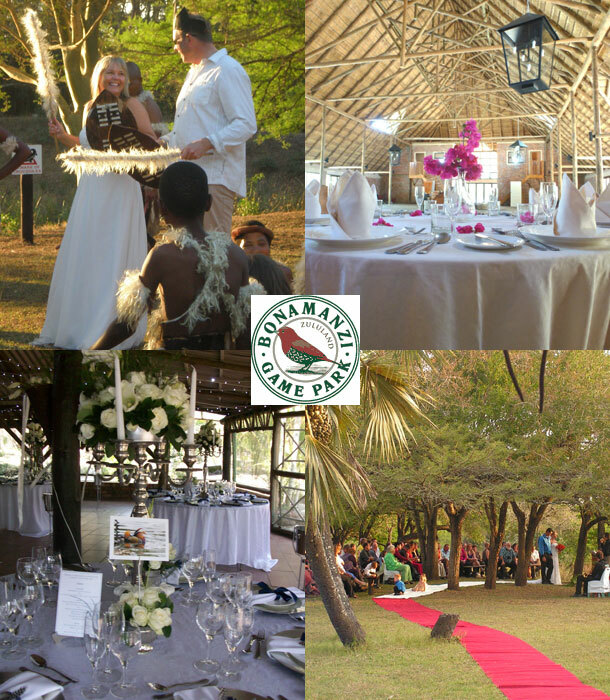 Turn your fantasy wedding into a reality at Bonamanzi and contact us for our special wedding package +27 (0)35 562-0181 or to send an enquiry see Bonamanzi Game Park.